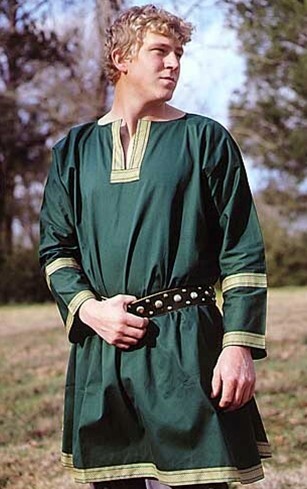 Like the Viking tunics of the Norman and Saxon periods, the sleeves and body of this authentic reproduction are cut as one piece, using only one seam. The neck opening, sleeves and hem are adorned with trim. 100% cotton (dry clean only) in brown or green. One size fits most, but also available in XXL. 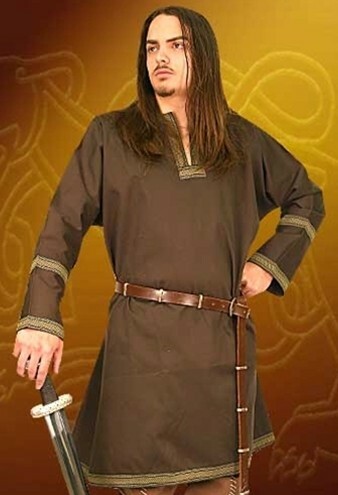 (Belts , and sword not included). To order, choose size and color from the dropdown lists, then click "Add to Cart."